Dr Howe is professor, Division of Natural Sciences and Mathematics, the Masters College, Newhall, California. He holds a B.S. in botany from Wheaton College, an M.S. in botany and a Ph.D. in botany from Ohio State University, where he was a Charles F. Kettering fellow. He also completed post-doctoral studies in botany at Washington State University; in desert biology at Arizona State University; and in radiation biology at Cornell University. As well as publishing technical papers and books in the area of botany, he has published numerous papers in the area of creation versus mega-evolution, and philosophy of science. He served as president of the Creation Research Society from 1977 to 1983. In 1953, I enrolled as a graduate student in the botany department of Ohio State University. My time at OSU (1953–1959) was filled with research in plant physiology, botany coursework, meetings at church and Intervarsity Christian Fellowship, and my marriage in 1955. As a result, there was little time left for evaluating origins theories. While never adopting theistic evolutionism, I continued to orient my view of fossils around the day-age interpretations, assuming that God’s miraculous acts of creation were somehow interspersed throughout eons of geologic time. When graduate studies were nearing an end in 1959, I applied to several colleges for positions teaching botany. Pursuant to each application, the OSU placement office sent my file (including transcripts of grades and various reference letters) to each college. I also contacted my old friend and advisor, the ebullient John Leedy at Wheaton College, Illinois, where I had been an undergraduate student. He informed me that there was a full-time opening to teach in the biology department at Westmont College, Santa Barbara, California, a school that was known back then as the “Wheaton of the West.” After visiting our home in Columbus, Ohio, Roger Voskuyl, president of Westmont, sent me a contract to teach there. For two reasons I promptly signed that document and mailed it back: (1) there had been no firm offers from any of the other colleges; and (2) I felt somewhat obligated to the Lord to spend at least one year teaching in a Christian college in return for the academic and spiritual blessings that an education at a Christian college had afforded me. Only a few days after the contract was mailed back to Westmont, a college of education in the state of Washington sent me a telegram containing an apology for a mix-up, and an invitation to teach for them at a salary that would have been $1,200 more annually than the Westmont offer! Instead of mailing my file to the Washington college, the Ohio State University office had inadvertently sent to Washington the job file of a certain George Earl Howe, a different OSU grad who had earned his advanced degree in some other field, such as business! Puzzling over this anomaly, the biology people in Washington had delayed processing my application. By the time the error had been rectified and an offer sent, I had, of course, accepted the other job. It appeared to me that this peculiar turn of events was a sign from God for me to go to Westmont. The Washington offer was rejected, and the position at Westmont lasted for nine years, not just one. In terms of the work God had ahead for me, this little glitch was no mistake at all, but an instance of divine serendipity. At Westmont I encountered academic freedom, as well as productive contacts with students and other faculty. There were opportunities to correspond and even visit with such renowned creationists as John Whitcomb Jr. and Walter Lammerts. It was an environment which allowed me to mature as a Christian teacher and to re-evaluate my own ideas about the fossil record. In spite of a very full teaching schedule, there was time for me to attempt to untie the Gordian knot: how to handle geology and Genesis at once. In that first origins class and in other science courses, I presented two or three approaches to the timing of creation events, and then I recommended that students make their choice. In some of those classes, there was a gifted individual named Art Hubbard. Whenever I presented various long-age creation theories involving deviant interpretations of Genesis, Art would cordially object and assert that the real meaning of the passage was being violated by such tactics. Another student who promoted a recent creation in my first classes was David Nicholas, who later became president of Shasta Bible College. In 1960 my department chairman, mentor, and friend, Robert Frost, encouraged me to read Flood geology books by the self-taught geologist, George McCready Price. I believe that one ought not to categorically reject the writings of people who lack a formal education in science. It must be remembered that Lyell was a lawyer (not a geologist) and Charles Darwin was a theologian. Bob Frost also lent me a copy of The New Diluvialism, a fascinating book in which the author, Harold Clark, accounted for the different assemblages of fossils in successively higher strata as the consequence of pre-Flood ecological life zones. These biomes, he proposed, were sequentially inundated and fossilized while the Flood waters rose and churned across the early land masses. This book showed me that there are viable alternatives to uniformitarianism in explaining the biostratigraphic “law of floral and faunal succession”—explanations that do not involve lengthy and unlikely periods of gradual sedimentation. A few years after that, a landmark paper appeared in Scientific American magazine entitled “Crises in the History of Life” by Norman Newell, a secular geologist.2 In this paper Newell marshaled plenty of evidence to show that fossils had been deposited by catastrophic (not gradual) means. Yet the author still clung to the overall uniformitarian framework by speculating that many catastrophes (not just one) must have occurred across earth’s elongated history. This view came to be known as “catastrophic uniformitarianism,” a binomial that is clearly an oxymoron. Readings from Price, Clark, and even Newell compelled me to broaden my horizons and to think about geological catastrophism as a likely corollary of the Noahic deluge. Concerning Bible interpretation, a monumental essay was penned by Raymond Surburg, “In the Beginning God Created,” in Darwin, Evolution, and Creation, in which this Hebrew scholar asserted that whenever the Bible word “day” (yom in Hebrew) is accompanied by the definite number like “first” day, “second” day, etc., it invariably means a real day, not some long age.3 This exegetical truth took root and began to undermine my speculations about age-long “days” in Genesis chapter 1. By his insistence on six real days of creation, Surburg jerked the rug from underneath the plethora of alternate readings for the creation timescale. This book likewise contained some anti-evolutionary chapters by eminent creation scientists, who later became my esteemed fellow board members in the Creation Research Society: Paul Zimmerman, John Klotz, and Wilbert Rusch Sr. While I have listed notable authors who promoted young-earth creationism in the early 1960s, I have saved the most prominent for last. Although it was published early in 1961, The Genesis Flood, by Henry Morris and John C. Whitcomb Jr., did not find its way into my reading schedule until some months later, when my brother Fredrick, a distinguished theologian, began pressing me to study it. Between those two covers, Morris and Whitcomb had packed a vast array of data that fit squarely with young-earth catastrophism.4 The Genesis Flood was and still is controversial among Christian apologists. Another worker who prodded me toward approaching a young-earth position was Bolton Davidheiser, a brilliant and uncompromising professor who had taught biology at Westmont before my time there. After hearing me review a book at a 1959 meeting of the American Scientific Affiliation in Los Angeles, Davidheiser corresponded with me about my neutrality concerning the issue of time in Genesis. In his own direct and guileless manner, he helped in the clarification of my origins stance. By 1963 my path had crossed with that of Walter Lammerts, a creation scientist who had already become known as the “Father of Modern Rose Breeding” because of his success in producing such exceedingly popular roses as “Charlotte Armstrong” and “Queen Elizabeth.” In 1964 Walter was the first president of the Creation Research Society. Although he knew of my lingering doubts about a young earth, he nevertheless allowed me to become a CRS member. At my invitation, Lammerts presented a Westmont creation seminar which was well attended by students, faculty, and off-campus visitors. He encouraged me to pursue my study of germination rates in seeds after weeks of soaking in ocean waters, as a means to understand how plants might have survived during and after the Flood. Lammerts likewise helped kindle my interest in performing various other creation research projects years later at Los Angeles Baptist College (now The Masters College) in Newhall, California. Many of Lammerts’ horticultural colleagues believed in gradual evolution, involving long spans of time. 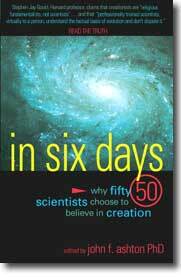 But as a creationist Lammerts assumed that whatever variation is possible will occur in the present and rapidly. It was to this underlying supposition that he attributed his achievements in plant breeding. His evolution-minded friends felt there was little chance of effecting any immediate change. Ironically, it was Lammerts, the creationist, who proceeded to find those changes and to use them in developing new roses! Lammerts’ circle of personal friends always included some “long-agers” and even a few hard-core macroevolutionists, with whom he carried on spirited but friendly dialogues. Herein I believe is an important lesson for creationists: whenever possible, let us take an irenic approach to our adversaries. During 1964 a threshold in my thinking was gradually crossed. Up to that year it had seemed to me that there was ample scientific evidence which demanded long ages. I imagined that such phenomena as C-14 decay, U-238 dating, the formation of coal, and the genesis of oil bore undeniable testimony to a vast prehistory for the earth. After crossing a mental “continental divide,” however, it became increasingly apparent to me that there is nothing in empirical science that compels anyone to embrace billions or even millions of years. C-14 dating has even led to truncating previous estimates for the elapsed time since the onset of the Ice Age. The disequilibrium between the measured rate of C-14 decay and the rate of its atmospheric production support an age of less than 10,000 years for the earth’s atmosphere. And so it goes. There is not even one scientific fact that furnishes an unequivocal demonstration of great antiquity. All the data find favorable alternative explanations within a recent creation position. As the end of this age and the Final Judgment draw near, believers everywhere are constrained to reaffirm the literal truths God has revealed about origins. Some day we must all answer Christ’s haunting query individually, “When the Son of Man cometh, shall He find faith on the earth?” (Luke 18:8). Edward O. Dodson and George F. Howe, Creation or Evolution: Correspondence on the Current Conflict, University of Ottawa Press, Ottawa, Canada, 1990. Norman Newell, Crises in the History of Life, Scientific American 208(2):76–92, 1963. Raymond Surburg, In the Beginning God Created ; in: Paul Zimmerman (Ed. ), Darwin, Evolution, and Creation, Concordia Publishing House, St. Louis, MO, pp. 36–81, 1959. Henry M. Morris and John C. Whitcomb Jr., The Genesis Flood, Presbyterian and Reformed, Phillipsburg, NJ, 1960.